The off-net sitcoms are back. After a year without any new major off-network sitcoms debuting (aside from Tyler Perry’s House of Payne), three of them debut today in broadcast syndication – NBC Universal’s The Office, CBS Television Distribution’s Everybody Hates Chris, and Twentieth’s My Name Is Earl. The other two have gone out of production this past year, due to mostly high production costs and declining ratings. Locally, The Office is airing at 6:30 p.m. and 10 p.m. on Fox-owned WFLD-TV; My Name Is Earl airs at 5 p.m. and 11 p.m. on sister station WPWR-TV; and Chris airs at 7:30 p.m. and 10:30 p.m. on WCIU-TV. WGN-TV announced Thursday it was expanding its 5:30 p.m newscast an hour in a slot traditionally reversed for off-net sitcoms. Fox affiliate WXIX-TV in Cincinnati also announced it too was expanding its evening newscast an hour, in this case from 6 to 7 p.m. The GM for the Raycom-owned station stated it was necessary for his station to compete with his other network affiliate brethren for viewers to take its news operation seriously. That’s bad news for syndicators of off-network sitcom fare, as more and more former independent stations in large and mid-size markets are producing local news costs less than it would take to purchase an expensive off-net sitcom, since stations keep all the ad inventory. Plus, these stations are looking to take advantage of the upcoming political season, where candidates (and the organizations supporting them) will spend lots of money and are likely to drop it on local news than an off-network sitcom. And all three new off-net sitcoms also landed cable homes: Office and Earl are on TBS; Chris is now on NIck at Nite, where it has drawn more viewers than it did during its CW run. Cable runs of off-net sitcoms – often on at the exact same time as they are scheduled on local stations -can drain the broadcast outlets of ratings points and revenue. Despite this, syndicators continue to roll out the laughs. For 2010, Twentieth has How I Met Your Mother ready to roll for syndication, as does Warner Bros. The New Adventures of Old Christine, and off-HBO series Entourage and Curb Your Enthusiasm. Thought: A short bone to pick with Fox’s L.A. duopoly. While KCOP slotted The Office at 7:30 p.m., why not slot it at 7 p.m. on stronger sister station KTTV, instead of Malcolm In the Middle? There’s no doubt in my mind The Office would have performed better, especially among adults 18-49. 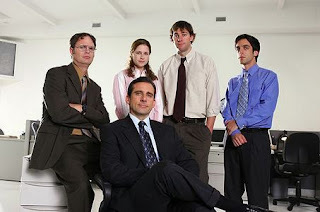 But don’t fear: KTTV is airing the second run of The Office at 11 p.m.